There are few equals when in it comes to Holiday Displays, musicals and traditions than the Country Christmas Package offered by the Gaylord Opryland and Christmas in Louisville with two luxurious nights at the Brown Hotel. Contact one of our sales reps and let us help you create the Best Christmas Tour ever! On the 1st Day of Christmas – Nashville & Gaylord Country Christmas – Arrive in Nashville for a Country Christmas celebration at the Gaylord Opryland Hotel for a two night stay. 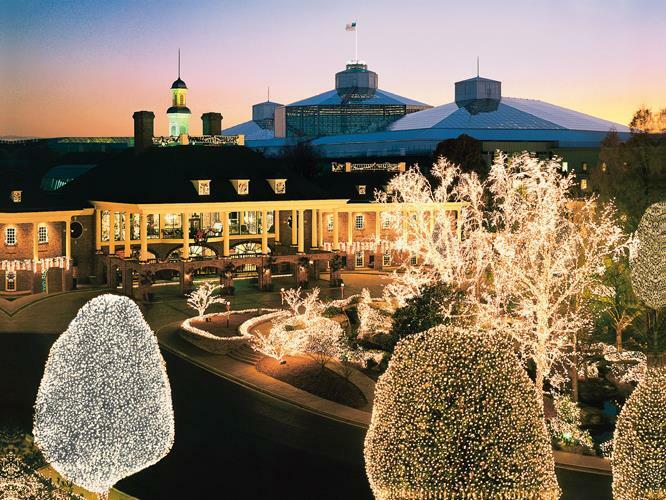 This evening enjoy the Opryland Hotel Christmas Dinner & Show. Grammy Award-winning Country superstar Trace Adkins will entertain fans with Christmas standards, Celtic classics, and a few of his favorite things. Join the multi-platinum artist and the renowned Gaylord Opryland chefs for a holiday dinner show to remember. On the 2nd of Christmas – Nashville & Gaylord Country Christmas – This morning visit ICE!, an incredible holiday attraction hand-carved from nearly two million pounds of ice. This icy exhibit is blends amazing frozen creations with thrilling ice slides, all enhanced by dramatic lighting and special effects. This year’s theme features the 1957 Dr. Seuss classic How The Grinch Stole Christmas! Watch how the Grinch tries to steal Christmas from the Whos of Whoville through interactive ice sculptures and displays. Experience your favorite scenes in magnificent hand-carved sculptures made from more than 2 million pounds of ice. Dinner is on own, giving you the chance to try one of Opryland’s great restaurants. Reserved seating for the Broadway Musical – “Cirque Dreams Holiday.” (Subject to change in 2019) Be dazzled by an array of seasonal characters brought to life in a dreamscape of imaginative costumes and creativity, while stunning feats of showmanship are unwrapped, performed on stage and in the air. Back by popular demand, Broadway director and Cirque Dreams founder Neil Goldberg is bringing the famed entertainment brand to Orlando for the second year in a row with this exclusive show. The entire family can enjoy this uniquely inspired 25-minute Christmas dream presented with the Broadway style and inventive theatrics for which Cirque Dreams is renowned. Following the performance, Guests can enjoy The Grand Snowfall as we turn our atrium into the world’s largest snow globe. On the 3rd day of Christmas – Louisville & The Historic Brown Hotel – After breakfast, depart for Louisville and you will be accommodated at the historic Brown Hotel for two nights of luxury. A Louisville legend, the Brown Hotel has been loved by generations of guests for its Georgian-Revival elegance and timeless Southern charm that infuses every experience with gentility and refinement. The hotels Holiday decorations will set a festive Christmas mood. Your group has dinner tonight at the Derby Dinner Playhouse, one of America’s finest dinner theaters. Show is still TBD, but it will be a show highlighting the spirit of Christmas. On the 4th Day of Christmas – Louisville & The Historic Brown Hotel – This morning after breakfast, your group will Join in all the Reindeer Games at the Kentucky Derby Museum. It’s a festive laugh-filled festive morning of Reindeer Racing. Everyone receives $5000 worth of $ $ Horsey Bucks $$ and a Reindeer Racing Program. You will notice immediately that all the Thoroughbred horses have been given Reindeer Names. The emcee will provide you with handicapping tips so you can pick a winner. Then armed with insider advice, a racing program and a fist full of Holiday Money you make your bets just before the bell sounds. It’s contagious excitement, you’ll be cheering and laughing with your travelers as they yell “On Donner, On Blitzen . . . ho ho ho.” The top three money winners (Win – Place – Show) receive silly prizes. Oh and everyone who wants, receives their own set of reindeer antlers to wear and keep for luck! Note: Serious race people will find the Derby Museum is also filled with a marvelous collection of everything that deals with the pageantry of the annual Kentucky Derby race. Also included: a walking tour of Churchill Downs. Then after a break for lunch on own, you head to the Louisville Slugger Museum. Take a guided tour through the factory where Louisville Slugger bats are crafted with the same pride that started in 1884. Whether it’s a personalized bat or one destined for the big leagues, we make sure it’s just right. You’ll learn every step in the process. After the tour, you’ll receive a FREE miniature Louisville Slugger bat! Next it’s off to the Frazier History Museum and its Nutcracker: The Exhibition. Presented in collaboration with the Louisville Ballet, the state ballet of Kentucky, it is a visual and scenic walk through the tantalizing sets and costumes of beautiful Nutcracker productions rooted in Kentucky. This endearing holiday classic has been part of the fabric of our community for six decades and the Louisville Ballet is one of the oldest professional ballet companies in the United States. Recalling historic local presentations guests will journey through the Stahlbaum Party Scene, the Waltz of the Snowflakes, and the Land of the Sugar Plum Fairy. The exhibition will also feature a collection of handmade Nutcrackers, photographs, and other artifacts. You then spend late afternoon and evening at The Evan Williams Bourbon Experience. It is an artisonal distillery located in downtown Louisville on Whiskey Row and celebrates the legacy of Evan Williams, Kentucky’s first distiller. This is an immersive experience that brings to life the history and tradition of Kentucky’s native spirit. Your group has a guided history tour and more. While here you will enjoy a tasting of three bourbons, and learn how to make a Mint Julep before sitting down to a nice dinner in The Speakeasy. Mint Juleps are the quintessential Kentucky Derby Drink and it is important to the “educational mission” of this Holiday Evening in a Bourbon Distillery that you learn how to make one. Following dinner is a historic music presentation by the costumed characters of “My Old Kentucky Home” Outdoor Drama. You will be serenaded by a few of Stephen Foster’s famous songs mixed with classic Christmas Carols you’ve know forever. On the 5th Day of Christmas – Departure – After breakfast, depart for home.